Cocktails swimming and free Wi-Fi and breakfast fly high on the list of amenities at the non-smoking Best Western Plus Airport Inn. The four-story Airport Inn furnishes 74 rooms with free Wi-Fi 43-inch flat-panel TVs coffeemakers mini-fridges and microwaves. A complimentary breakfast buffet is served each morning. Guests can also retreat over cocktails in the lounge. Enjoy a dip any time of year in the heated indoor pool and hot tub. Additional pluses include a fitness room and business center as well as coin-operated laundry facilities. On-site parking is free. Off I-20 the Airport Inn lies in the Westwood Park area of Shreveport less than three miles south of Cross Lake and one mile north of Shreveport Regional Airport. Travel three miles to explore exhibits at the Louisiana State Exhibit Museum or nine miles east for the works at the R.W. Norton Art Gallery. Big fun abounds at Harrah's Louisiana Downs Casino and Racetrack 15 miles northeast. 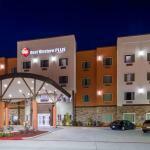 Guests are also within six miles of I-49 and a 10-minute drive from the Shreveport Convention Center.